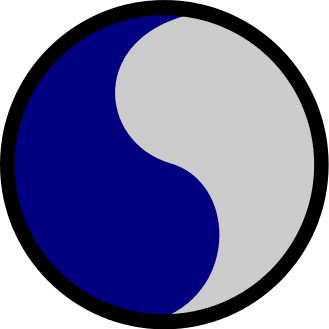 At last weekend’s symposium, several people asked me about my lapel pin, which is a Korean taeguk of blue and gray swirls chasing each other – the classic “yin and yang” shape. (It is pictured below.) I periodically wear the pin when giving Civil War talks. The 29th fought in both World Wars, most famously assaulting Normandy on June 6, 1944. Still on the books today, the division and its elements have served in Bosnia, Iraq, and Afghanistan since 2001. I have a connection to the division, being since 2002 an Honorary Colonel of the 116th Infantry Regiment, Virginia Army National Guard (The Stonewall Brigade). The division patch is a perfect symbol for the war and its reconciliation. I also wear it to pay tribute to the 29th itself and its record of success. This entry was posted in Armies, Leadership--Confederate, Leadership--Federal, Ties to the War and tagged 29th Division, 29th Infantry Division, Afghanistan, Bosnia, Iraq, Korea, Maryland, Normandy, Stonewall Brigade, Virginia, Washington D.C., World War I, World War II. Bookmark the permalink. 29 Lets Go! It might be worth noting here Joe Balkoski’s superb series of books on the division, charting’s it’s WWII history from mobilization through to the end of the war in Germany. Yes, Joe’s books are fantastic. Anyone interested in the 29th during World War II should read them. I’m glad you posted this. When I asked you about your pin and you explained the story, I thought it was wicked cool. Thanks for sharing. My first encounter with the stonewall brigade (116th Infantry) came as a Cadet at VMI, where our tank platoon played aggressor against one of their NG inf companies. That was a very interesting experience. I still have the Stonewall shoulder patch from them. About 2002, I visited Vierville Draw, where the 2/116th landed in Normandy on June 6, 1944. There are monuments there to the men of the 116th, as well as other units that came ashore. I was proud to wear the Stonewall Brigade patch as a member of C Troop 1/183rd Cav from 1982 until it’s conversion to the 29ID. That patch got lots of attention in Ft Knox at OSUT. Yes it does, the patch is unique. One of the best staff rides I ever led was for the officers of 2/183d in 2006. We looked at cavalry operations in and around the Wilderness, and had some excellent discussions.